Designed to be securely fixed to the wall for safety, these units have side panels made from fully-welded stainless steel; the solid front panel is removable only with a specific size of Allen key – ensuring access can be gained only by authorised personnel. These sinks can also prove useful in secondary schools and colleges, where vandals can otherwise access and damage plumbing. 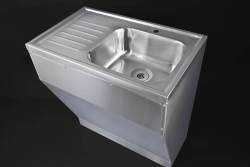 We generally supply our security sinks with a choice of standard-size bowls; however, there is the option of a bespoke bowl, should a specific size or shape be required. If a bespoke bowl is required, options include your choice of exact siting of taps, overflow (if required) and drainage hole. All of our sinks and other stainless-steel products are extremely durable and impact-resistant: an essential consideration when dealing with potential vandalism. If aesthetics are of more concern than vandalism, you might consider one of our standard sinks, with bespoke built-under storage (lockable doors or drawers are an option). This would still conceal unsightly plumbing – but would prove a truly practical use of space. Do get in touch if you have very specific requirements for your prison or police station: we pride ourselves on being able to fabricate the requisite product for each client. 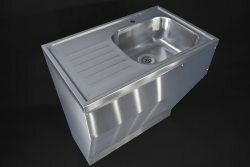 We provide a wide of other stainless-steel items, including shower trays, worktops, urinals and wash troughs. 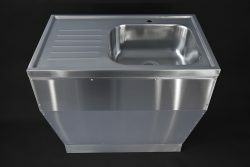 Our laboratory shower trays are fabricated from 316 laboratory-grade stainless steel. This premium metal offers impressive levels of heat- and corrosion-resistance, and will last for decades. Whether you need a shower tray for an off-laboratory wet room or decontamination shower, or as a chemical-resistant base for a large experiment space within your lab, we can create the product you require, to your specifications. customisable shape or size – we can fabricate the tray to fit an exact space. We also offer a wide range of other laboratory products – from bench tops, tables and mobile units to shelving, fume cupboard liners and many types of sink and basin. Contact us today, to discuss the requirements for your laboratory. Our stainless-steel shower trays are fully bespoke, to the client’s exact specifications. No other material matches the supreme hygiene levels of stainless steel. With its inbuilt antibacterial properties and ease of cleaning and maintenance, it is the first choice for any healthcare environment, from hospitals to care homes. For more information on our shower trays – or on any of our wide range of stainless-steel products, all suitable for your clinic, hospital, surgery or dental practice – please get in touch today. The sheer durability and ease of maintenance of our stainless-steel shower trays make them the ideal choice for your academic environment. From showers for school sports centres to decontamination showers for university and college laboratories, our trays will stand up to even the most demanding usage. This durability makes them the viable economical choice for your project: they will outlast shower trays made from all other materials. choice of standard, 304 food-grade steel – resistant to rust, stains and heat – or 316 laboratory-grade metal, which will also cope with corrosive chemicals from laboratory work. We offer a wide range of other stainless-steel products to furnish your academic environment. Take a look at our sinks, hand-wash basins, urinals, vanity tops, and many other items – or contact us today, to discuss your project. In a washroom, you need a shower tray that will stand up to high traffic and usage. Our stainless-steel shower trays are the most durable product available: resisting knocks, cracks and staining. No other material on the market will give you such a lasting product. for a laboratory washroom, where corrosive chemicals may need to be washed away, 316-grade steel shower trays are available. Please see the ‘Shower Trays for Laboratories’ section, above. Contact us today, to find out about our bespoke service. 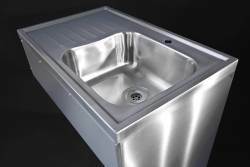 We also provide a wide range of other stainless-steel products, including urinals, cupboards, shelves, worktops, vanity tops, basins and sinks. Sleek, streamlined, highly-reflective and simply stunning: each of our bespoke stainless-steel shower trays is hand-crafted in our Nottingham factory to the individual’s requirements. Whether you need a specific shape of tray to fit an awkward corner in your bathroom, or you want to complement a cutting-edge shower cubicle with an equally striking tray, we can fabricate the product you require. Our shower trays are made from premium, food-grade steel and are so robust and durable, we confidently supply them with a twenty-five year guarantee*. Each of our trays is crafted from a raw steel sheet which comprises around 60 per cent recycled materials. The end product – which will last for decades – is also fully recyclable, making it the most environmentally-friendly option for your bathroom or wet room. The premium steel we use is also the most hygienic material for a bathroom – it boasts inbuilt antibacterial properties, making it simple to wipe clean of germs. We also offer a wide range of other high-style items especially suited to bathrooms and kitchens, including stainless-steel worktops, cupboards, shelving, sinks and basins – or even entire kitchens, for a truly contemporary home. Check out our full range today, all of which is fully customisable – or drop us a line by email, to discuss your requirements. *Please refer to the Resource section of our Help and FAQ page, for full warranty terms and conditions. Whether you need a shower tray for personal/employee use or to wash your patients, our stainless-steel trays are the answer. Made from food-grade steel, they will stand up to the heaviest use without cracking, staining or rusting. Because every tray is made to order in our Nottingham factory, you can specify the exact size and shape of product you need, to fit the space available and accommodate the end users – be they large dogs or human beings. We can also add a small upstand to any side/s of the shower tray, to serve as a tile return, to provide a watertight finish against a tiled wall. For a neat ensemble, add one of our removable steel panels; these fit beneath the shower tray, to allow easy access to plumbing and waste units beneath the shower.